Gili Labak is a small island that located in southeast side of Puteran island, the capital city of Puteran island or Madura island. Administratively, this island is in Talango sub-district, Sumenep regency, East Java. This small island is covered only 5 hectares and there are 35 families live in this island. For those who visit this island can explore the whole island for only 15 minutes over the beach. The inhabitants are living by the sea products for the land is not that fertile to be planted. At this island, not only white sandy beach that we can explore, but also the beauty of the underwater world. At some point, this island has a superb view, that captivating sea coral wrapped with beautiful fish swimming around the ocean, and bring the elegance to the bottom side of this island. Moreover, the bright blue sky, the sparkling water over bluish ocean and the tickle white sandy beach is the thing that will intimate you while having trip to Gili Labak. While having this island for your sweet escape, doing snorkeling, swimming, sunbathing or just playing around the beach with your bare-feet is highly recommended. Yet, since the genuine place and the lack of the facilities around the place, it better for you to bring your own equipment when you need to snorkeling and diving, for there are no rented equipment for this deal. This is also including for your other important needs like food and first aid kid. Moreover, those who want to stay at the island, the electricity is on during the night; by using diesel it brings the lights on from 6 – 11 PM. However, while pampering yourself in this hidden paradise, stay honor the nature and keep your hands for being idle and not to give any garbage, harm signatures or unimportant stuff to be left at the island. Commonly, to reach this place is takes only 1,5 hours from Kalianget port and after reaching this place, we can see the clean and sparkling water over the island. Yet, there are some best ways to reach, according to your like and routes. This route is one of the most widely used, for the strategic location enable the visitors to pass through this route. To take this route the visitors should be depart from the heart of Sumenep to the eastward, approximately 10 km far. After arriving at the port, the visitors simply looking for a boat to be hired and sail to Gili labak. Today, there are many services for tour and delivering the visitors to the island. Choose wisely and brows as many as information to pick the best one. Lobuk village is a village that contained of mini-dock or harbor. This place is one of routes to the Gili islands, either Gili Genting and Gili Raja. However, since the dock at this village getting famous and crow, there are many visitors choose this route to reach Gili Labak. This is because for the visitors who come from outside Sumenep will be closer to take this route compared to other routes. Those who are coming from outside Sumenep can immediately turn right at the Bluto junction. From this point to the right route, and then going on to the eastern side until finding a small pier. Last, the visitors can immediately order a boat or can choose to use sailing services to Gili labak. Another place that can be used as a route to Gili labak is Tanjung Saronggi or Saronggi Cape. It can start from the Saronggi junction, go to the east until reaching the shore. There are dock with many of small boats available to Gili Labak. This village is located at Talango Sub-district. The route from the city is about the same as we pass from, Kalianget. The difference is we have to reach Kalingat first to go to Talango by land route to reach Kombang. After arriving at Kombang, we can immediately order a boat with cheaper price and it has shorter time to reach Gili Labak. Among those four routes it takes almost the same time, which is 1,5-2 hours, depending on the weather and the winds that often disrupt the journey to the island. 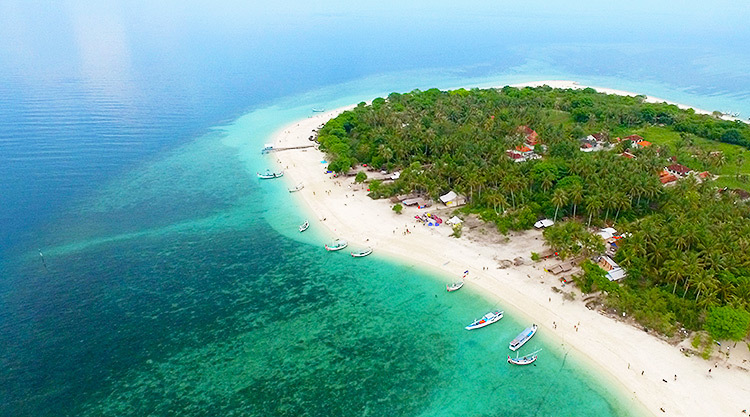 To obtain an affordable price, it suggested that you go to Gili Labak in groups, for at least 8-10 people. The more the passengers come, then you can have way affordable price to rent a boat.